On his 16th birthday, a strange mark appeared on Link's hand. Zelda's nursemaid Impa took Link to the North Palace and revealed the very first princess Zelda, trapped in a sleeping spell for generations. If Link is to wake her, he must acquire the Triforce of Courage from the Great Palace. To gain entry to the Great Palace, Link must place crystals in the palaces all over North Hyrule. But danger lurks at every step, as Ganon's forces seek the blood of Link to revive their evil king. Link will need to learn new combat abilities and magic spells if he is to overcome the challenges that await him and face the final challenge. The legendary hero who slayed Ganon and restored peace to the kingdom of Hyrule. Now he must venture across North Hyrule to retrieve the Triforce of Courage from the Great Palace. A princess from a golden age of Hyrule, put into an eternal sleep by her greedy brother and an evil wizard who sought the power of the Triforce. Only by finding the Triforce of Courage can Link awaken her. A jelly-like monster that moves slowly and wobbles around. They aren't very strong. A tougher relative to the Bit that can jump around. They may also appear in palaces. A spear-carrying creature loyal to Ganon. It's lunges at Link with its spear, and some varieties throw them. A spider that lives in the trees. When Link passes by, they will dangle down from their webs. The blue variety will drop to the ground and chase Link. A bat that nests in caves or trees. When Link passes by they will swoop down to attack. A land octopus that spits rocks. Some Octoroks will jump in one spot while others will move around while attacking. The blue ones are stronger than the red ones. Known as "Little Devils", the Goriya attacks Link with its boomerang. Use your shield wisely to defend against boomerangs from the front and back. A burrowing insect that lives in the desert. The Geldarm blocks Link's path, but it recoils when struck with the sword. Only its head can be damaged. When a red Ache drops to the ground, it transforms into the devil Acheman. It will spit fire to attack before retreating to the ceiling for safety. A creeping bug that drags itself along the floor. A Lowder will give chase if it hears Link nearby. A bird that dives from the sky and lunges at Link. While it can be defeated, an unlimited number of them can attack from one spot. A strange foxlike enemy that leaps around. It isn't strong but it can be hard to hit. A fish skeleton that leaps from the rivers and attacks. Some varieties spit rocks, while others just give chase. A small slime creature covered in thick spikes. You will need to learn the Downward Thrust in order to defeat it. An alligator soldier that attacks Link with its axe. Link's shield isn't able to defend against it. Some Dairas will throw their axes from afar to hit Link. Floating eyes with a thick shell that protects them from most attacks. It is only vulnerable when its eye is open. A thorny, burrowing plant that lives in the desert. Leevers will emerge from under Link's feet, trying to sap his energy. An amphibious race that can shoot deadly beams. It is invulnerable to all attacks except for the Fire Spell. A spider-like creature that hops around. Only its body is vulnerable to Link's attacks. A flying insect that appears suddenly and drops rocks on Link. A one-eyed ghost that flies around in an erratic pattern. Some varieties are invisible unless Link holds the Cross. A giant scorpion that shoots fireballs from its spiked tail. It is invulnerable to attacks while its eye is closed. A strong reptilian soldier. Some attack with spears and shields while others use maces. A rare variety guards the Great Palace by throwing rocks at Link from behind a tall wall. Wolf soldiers that charge around the palaces. They don't stop to fight Link, but keep on running. They can be slow or fast. Skeleton knights armed with swords and shields. While they never defend their legs, some of them can jump around. A red demon that hurls maces in an arc. Link has to sneak through the onslaught to hit it with his sword. A deadly armored knight who attacks with a sword and shield. It defends and attacks well and can be difficult to strike. The orange variety is the weakest, the red stronger and the blue stronger still. Some blue Ironknuckles can fire sword beams. A spirit that floats around in the dungeons. If it touches Link, he loses health and Magic Points. It can be defeated, but it takes a lot of hits. Floating statue heads that travel in a wave formation. Link must time his jumps carefully to avoid being hit. Floating statue heads that move forward, up, forward, down, spitting beams as it goes. A statue that spits droplets of lava. Link has to pass through when it's safe. Sometimes the Yodare will spit a blue drop that turns into a Bot. A ghost that chases Link, dropping fireballs everywhere it goes. It is easier to just run through if a Fire Moa appears. A witch who appears, casts a fire spell on the ground and then vanishes. While Mago can be difficult to hit, it rewards Link with a lot of experience. An armored Stalfos. Its attacks are the same, but it is resistant to Link's downward thrust. An armored Guma. It attacks by throwing its clubs at Link. A wizard that appears, casts a magic spell and then vanishes. It can't be hurt with conventional weapons, but if you acquire the Magical Shield you can reflect its own magic back at it. A powerful bird that resides in the Great Palace. It spits fireballs that can prevent Link from coming close. Some fireballs will chase link across the ground. A snake-like creature that spits rocks and jumps around in the dungeons. The red variety can spit fire. A giant Bubble that appears in the Great Palace. If you manage to wear it down with your sword, it splits into two Bubbles. A giant Bot that drops from the ceilings of the Great Palace. Strike it with your sword and it will split into a group of strong blue Bots. A hawk knight that resides in the Great Palace. It attacks like an Ironknuckle but it is also able to jump around. The red and blue varieties attack in different ways. An armored horse night and guardian of Parapa Palace. It moves slowly, swinging its mace when Link comes close. Its only weak spot is its head, so jump up and strike it with your sword to take it down. A knight who shoots fireballs as its attack. It is the guardian of the Midoro Palace (and the Palace on the Sea in the Japanese version). Knock off its head and it will grow a new one while its helmet flies around shooting. Do this again to reveal Helmethead's true face. An Ironknuckle riding an armored horse and guardian of the Island Palace. If you use the Downward Thrust on its head, it will fall from its horse and attack normally. Unlike other Ironknuckles, it will back away from Link's attacks, making it hard to hit. Boss Ironknuckles also appear in the Three Eye Rock Palace as a miniboss. Leader of the Wizzars, and guardian of the Maze Island Palace. To defeat Carock, Link must use the Reflect Spell to bounce Carock's magic attacks back at it. A powerful giant who wields a ball and chain, and guardian of the Palace on the Sea in the American version (replacing a rematch with Helmethead). Link must avoid its attack and run in to land hits before retreating again. A fierce lava dragon and guardian of the Three Eye Rock Palace. It rises from the lava and attacks Link with fireballs before retreating. Link must strike its head, being careful not to fall into the lava pits. The monstrous guardian of the Great Palace. It protects itself with a shield that can only be broken by casting the Thunder spell. 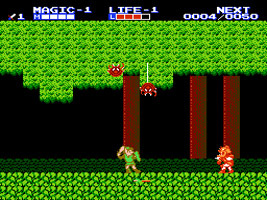 Then Link must strike its face with his sword while avoiding its many fireballs. The final challenge. Before Link can claim the Triforce of Courage, he must first defeat the darkness from within. Shadow Link knows all the same sword moves that Link does, and can be a very aggressive opponent. Restores some of Link's magic. The red Magic Jar restores more magic than the Blue variety. A bag filled with treasure. It provides Link with additional Experience Points. Increases the number of hearts in Link's health meter by one. Increases the number of blocks in Link's Magic Meter by one. A doll that resembles Link. Rewards Link with an extra life. They can only be found once. A bright candle that brightens up even the darkest of caves. Allows Link to break down rocks and certain trees on the world map. A glove that makes Link strong enough to break the blocks in palaces with his sword. A seafaring vessel that allows Link to travel from docks to find new areas on the map. Magical boots that allow Link to walk on certain areas of water on the overworld map. A mysterious item that can be used to scare away the river demon and to make the Three Eye Palace appear on the world map. A special key that can unlock any locked door, and can be used an unlimited number of times. A holy relic that allows Link to see invisible enemies in certain areas of Hyrule.